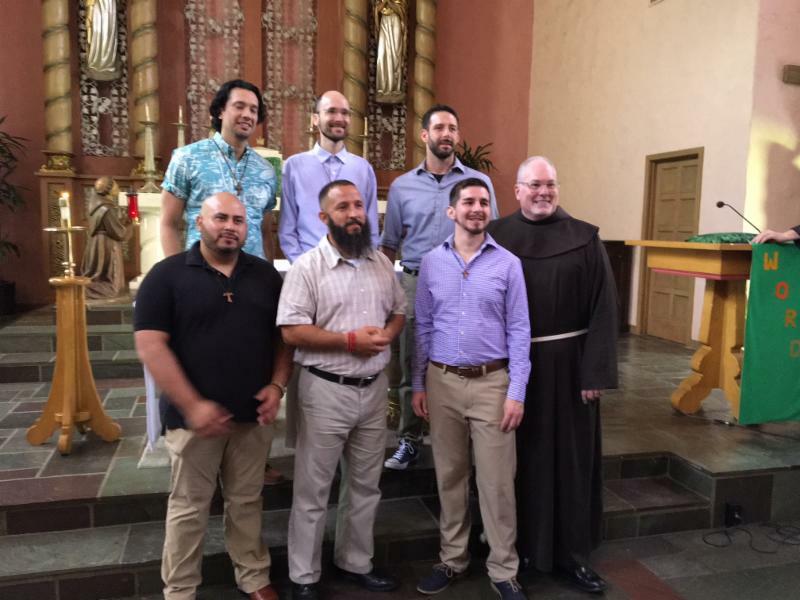 Brothers, here is information for you about the reception of new novices, which took place on Monday, July 16, 2018 at Old Mission Santa Barbara. On Monday, July 16, 2018—a typically balmy Santa Barbara morning—14 new novices representing all six of the US provinces involved in the R + R (Revitalization + Realignment) process were received into the Order. 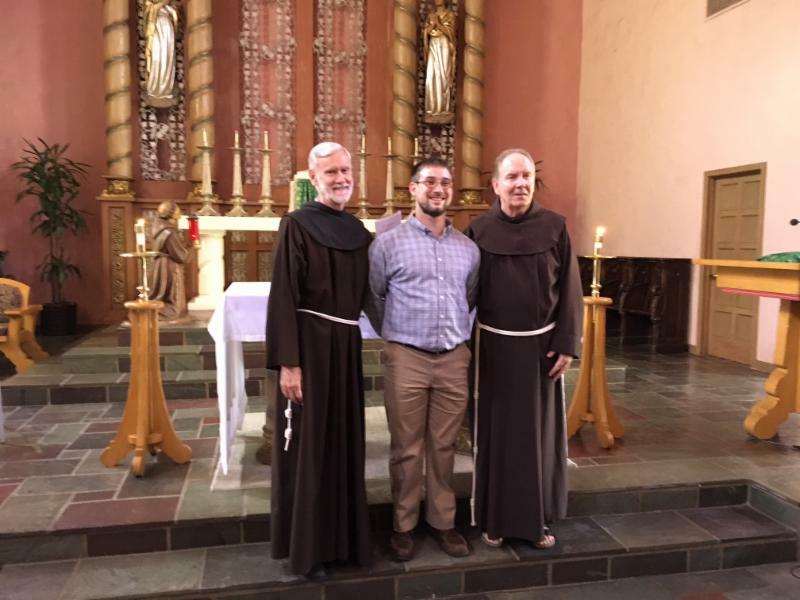 One of the group, Bernard Keele (OLG) received the Rite of Probation initiating his transfer from the Benedictines to the Franciscans. In addition, two men from Christ the King province in western Canada—not present-- are awaiting their US visas before they can join their US confreres in the program. The sense of family was reinforced in the remarks given by Provincial Minister Jim Gannon of the Assumption of the Blessed Virgin Mary (ABVM) province. Following the proclamation of the Prologue of the Gospel of St. John (1:1-10), Father Jim mentioned that it reminded him of not one, but three separate generations of baptisms witnessed in his native Philadelphia. He began by mentioning the parish priest of his own childhood who, typically, immediately following the baptismal rite, would carry the infant in his arms from the rear of the church. The priest would then “present” the infant by placing it on the main altar, while he recited the Prologue, formerly known as the “last Gospel”. Fr. Jim shared that this same custom has been treasured in his own family for three generations now. During the actual reception of the new novices, each man was called by name and, along with two solemnly professed friars as witnesses, signed the Book of Reception. Bernard Keele (OLG) was welcome separately into “a time of probation” with the friars. Also in attendance were representatives of each of the six participating provinces, including: Provincial Ministers Jim Gannon (ABVM), Jack Clark Robinson (OLG), Ralph Parthie (SH), David Gaa (SB), and Mark Soehner (SJB). Friar Basil Valente represented Holy Name Province. 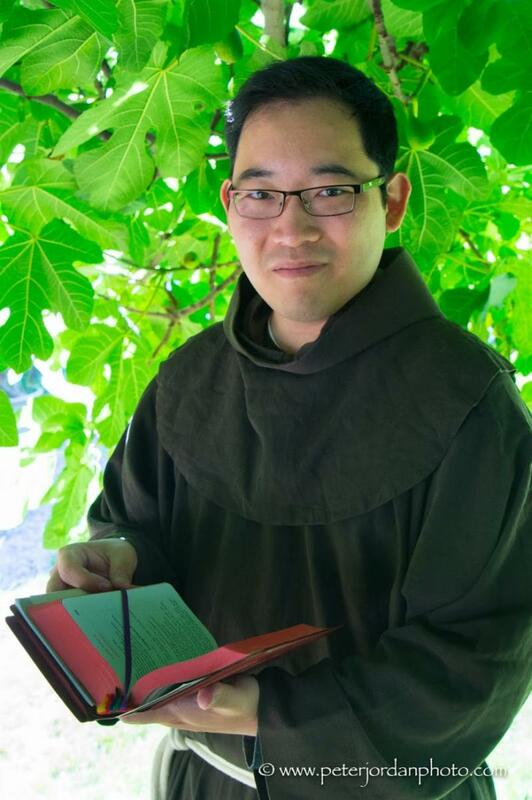 Afterwards, Provincial Minister David Gaa, of the Province of St. Barbara, presented each new novice with a journal of his own “to write and express your journey.” “. . . . Be attentive to the workings of the Spirit and (even) the days you resist the challenge,” he urged them. 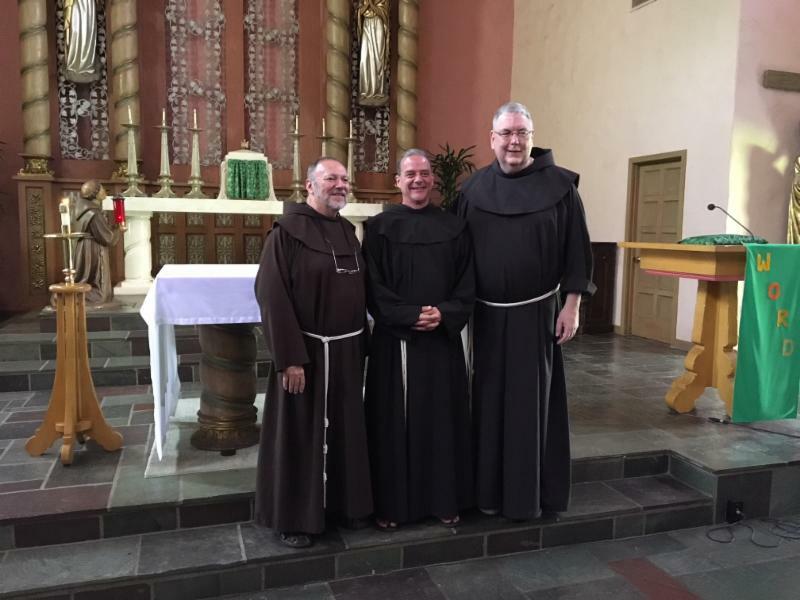 The service concluded with blessings of and by this year’s interprovincial novitiate team, consisting of Friars Jeff Macnab (SB), Michael Plastic (HNP), and Michael Jennrich (SH), as well as Sister Susan Rosenbach SSSF. 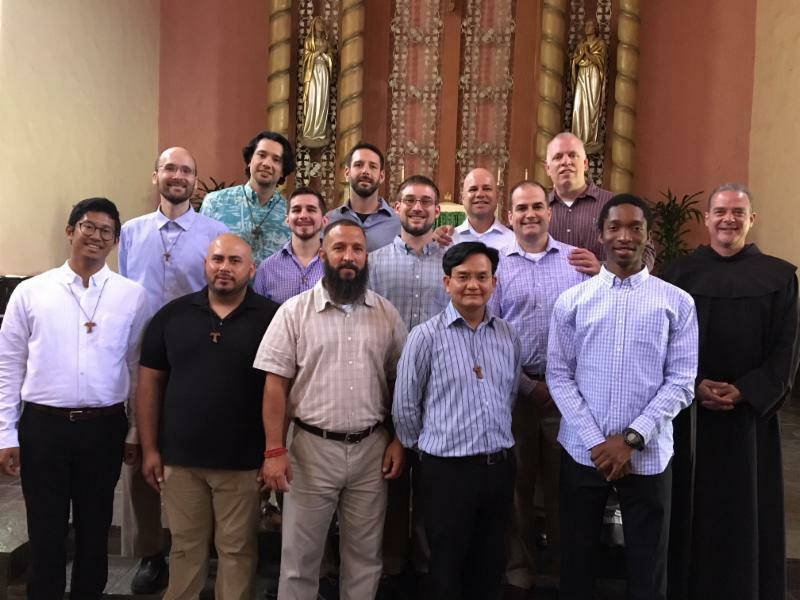 The new novices include: Andrew Aldrich (ABVM); Ian Grant, Loren Moreno, John Neuffer, Richard Phillip, Carlos Portillo, and Steven Young—all of Holy Name Province; Nhan Ton (SH); Andrew Dinegar, Salvador Mejia, and Joshua Tagoylo (SB); Raphael Ozoude and Matthew Ryan (SJB); and Bernard Keele (OLG), formerly of the Benedictine order. Still to arrive are Adrian Macor and Theodore Splinter of the Province of Christ the King (western Canada). Holy Names Province: (front, l to r): Novices Carlos Portillo, Richard Phillip, Steven Young, with Friar Basil Valente. (rear, l to r) Novices Loren Moreno, John Neuffer, Ian Grant. 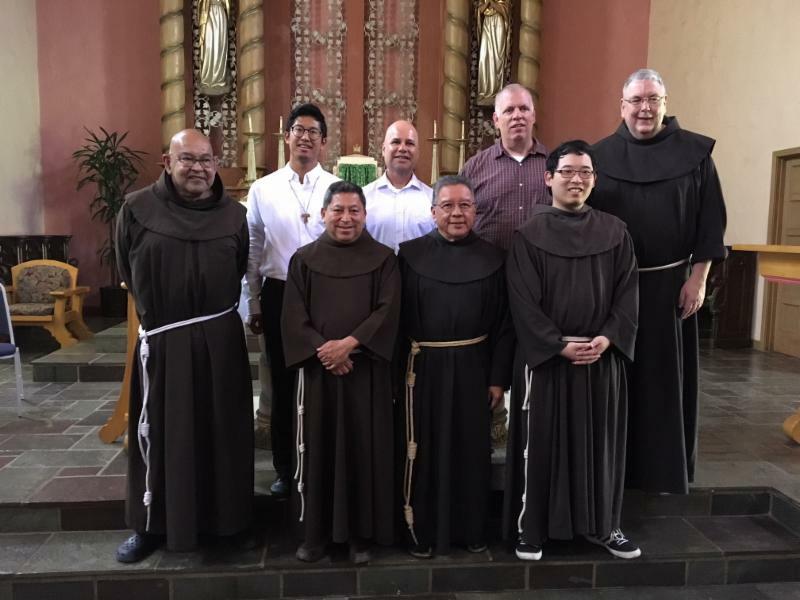 Province of St Barbara: (front, l to r) Friars John Gutierrez, Freddie Rodriguez, Zeno Im. (rear, l to r) Friar John Gutierrez; novices: Josh Tagoylo, Salvador Mejia, Andrew Dinegar; Friar Jeff Macnab. 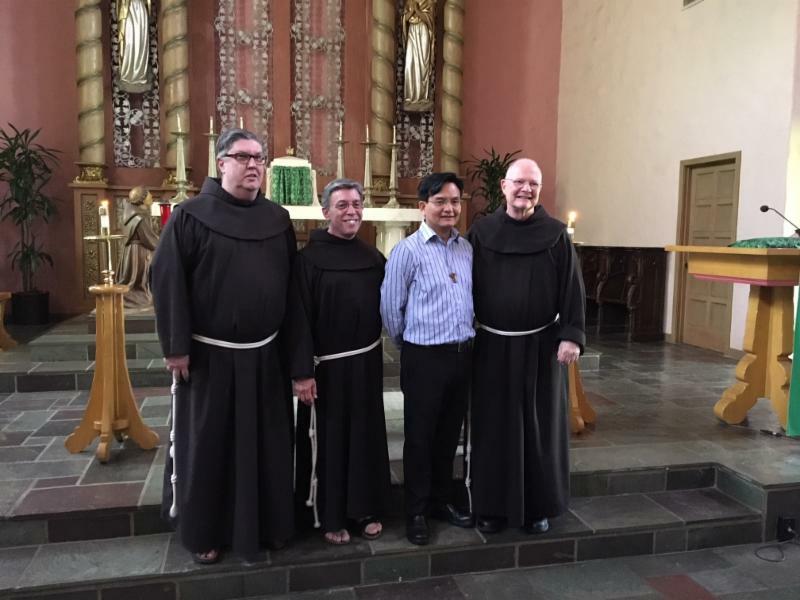 Sacred Heart Province: (l to r) Friars Jim Lause, Michael Jennrich; novice Nhan Ton; Friar Ralph Parthie. Assumption of the Blessed Virgin Mary Province: (l) Friar Kevin Schroeder, novice Andrew Aldrich; Provincial Minister Jim Gannon. Our Lady of Guadalupe Province: (l to r) Provincial Minister Jack Clark Robinson, Brother Bernard Keele (admitted to time of probation), Friar Jeff Macnab (SB). 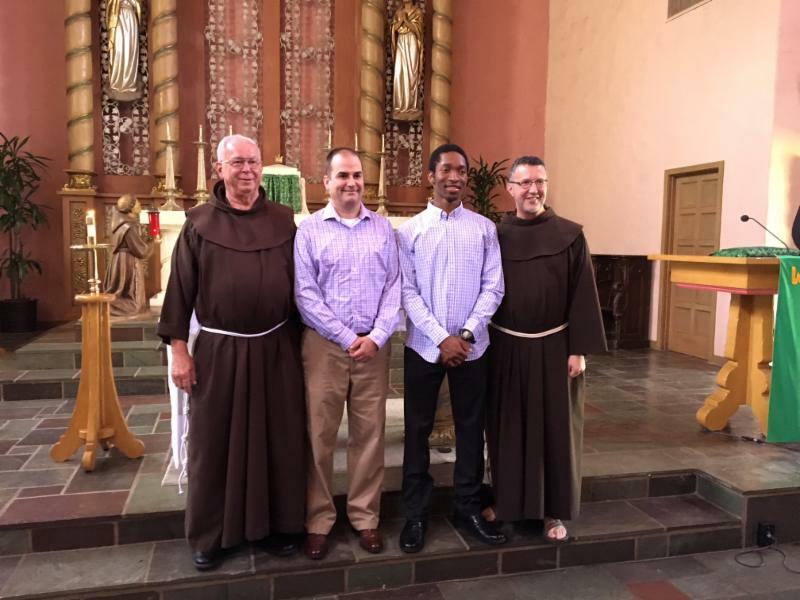 St. John the Baptist Province: (l to r) Friar Karl Langenderfer, novice Rafael Ozoude, Provincial Minister Mark Soehner. Take Highway 2, exit at San Fernando Road. Parking on Arvia Street.